The busiest time of year for us is rapidly approaching and the work isn’t going to slow down come the New Year, read on to find out why. Many of you will know that we have long had plans to open a Hop Stop in Reigate and finally late last week we moved a big step closer with Reigate and Banstead Council discharging conditions they had put on our planning application. The process has been a long one, it is over a year since we first looked at the premises and the planning process itself has taken approximately 8 long months. Seeing the final email come through with status ‘approved’ on it was with mixed emotions, relief at it finally coming through and excitement at what next year holds. Our vision for Reigate is a beer focussed bar where customers can drink on site and also take beer away for enjoying later. We will of course provide frequent updates as to the progress but at this stage we are aiming for a Spring opening. Inevitably that might have you thinking with Ruth and I busy with Reigate next year what will happen with the shop? Well most importantly, nothing! The shop will still be open as normal (barring a small tweak to our hours post Christmas) just it might not be Ruth or I behind the counter from time to time. This brings me nicely to Kevin, a beer lover and new addition to the Hop Stop team who will be joining us in December. Speaking of December next week I will detail our Christmas hours and Christmas draught beer pre-orders. Last night I attended a trade event put on by one of our suppliers which had a different spin on it. 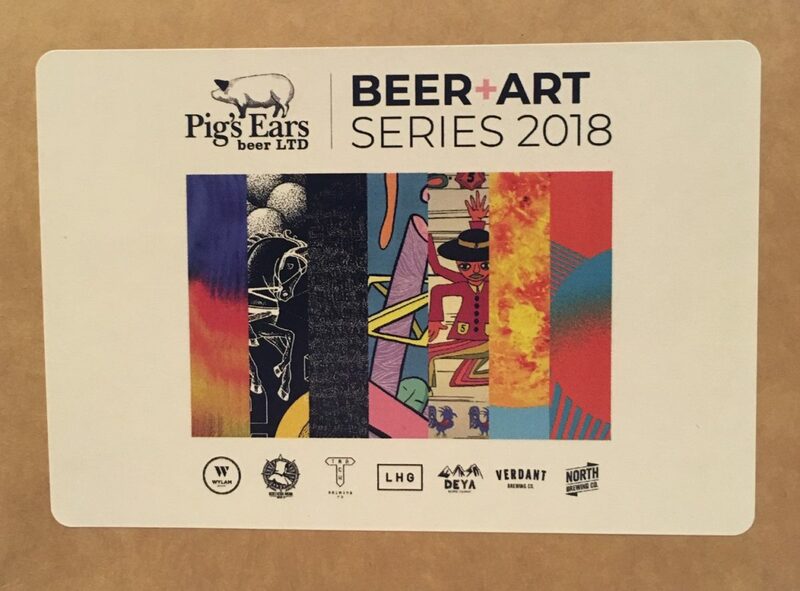 Held at the Tate Modern not only did it feature 7 beers from top UK breweries (Deya, Northern Monk, Wylam just to name a few) it also showcased art from the designer behind each breweries branding. Now I am not much of an art connoisseur but the 7 different beers were certainly tasting good and you will have a chance to make up your own mind when the beers begin to appear in the shop from next week. I was particularly taken by the Northern Monk Cherry Flipa, a sour IPA which was fruity and tart in equal measures. It was a fun event in a great venue, keep an eye on the Tate Modern Terrace Bar as they host many beer related events. A recent conversation with a customer got me thinking that it would be a good time to remind you all that we carry a range of gluten free, vegan and low alcohol beers. They might not always be obvious from looking at the front of the packaging but have a chat to us about your requirements and we can point some beers out to you. A current favourite is the gluten free and vegan Fantasma IPA from Magic Rock, it is a smasher. When is a new arrival not a new arrival? I grapple with this question often (yes, only the big issues here at Hop Stop). If we have had a beer on keg but not in bottles before should I feature it here? How about if a brewer tweaks a recipe? Then of course at this time of year we get all the Christmas beers in, many of which are returning from last year. Technically they aren’t new arrivals as such but since it has been such a long time it is worth featuring them again. So from next week until Christmas I will keep introducing brand new beers plus highlighting an old Christmas favourite which has returned. Drinking this reminded me a little of eating a spoonful of cocoa powder, big chocolate notes but also a dry, powdery mouthfeel. In fact this was one of the driest beers I can recall having in a long time. Not only dry though there is also a deep roasted note and a pronounced bitterness which drinkers will either love or hate. Bang on trend Fantasm Planes pours a hazy pale and gives off citrus and stone fruit aromas which carry through to the taste. Wheat malt helps with the mouthfeel and a clean Kolsch yeast really lets the hops shine through. Another banger from Whiplash. I haven’t ever added brandy to a brown beer before (don’t act so surprised) but if I had I imagine it would taste something like Speciale Noel. A strong, ruddy brown in colour with a distinct warmth and slight note of apples it hit the spot during the bout of cold weather we had recently. Surrey Hills Ranmore 3.8% (cask) Pale with a bitter bite.